Come and visit this lovely & solidly built Mexican home, which has a pretty high ceilings on the Living Room & Dining Room. The covered terrace has a great Lake View facing south and garden & private pool. This house was lay out with 2 bedrooms and 2.5 bathrooms in the main home and has 2 bedroom & 2 bathrooms in the lower level with a basement, that could be used as storage. Also has a totally detached room & bathroom planned as a maid's quarter with kitchenette. The laundry room is totally detached from the house. Has a great pool, garden, BBQ area, covered terrace and a Big Carport for 4 cars. The main house has a master bedroom with en suite bath & walk-in closet, with a great Lake View & your own fireplace that works with propane or burning wood. Also has a family room / TV room and Office/Den and a Guest Bedroom with full bathroom. 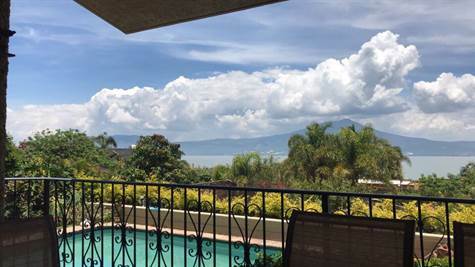 The kitchen Is quite ample with granite countertops and lots of shelves for storage, next to the dining room which has a great lake view and is located next to the covered terrace, where you can entertain and enjoy the breeze & the beautiful lake view. In the covered terrace an elevator was installed so you can take a person in a wheel chair down to the pool. This Home has a double car garage with 2 automatic doors opener, water cistern, purification system and separated laundry room, 2 on demand water heaters next to the bathrooms, in order to get the hot water immediately. This house is for Sale Unfurnished.